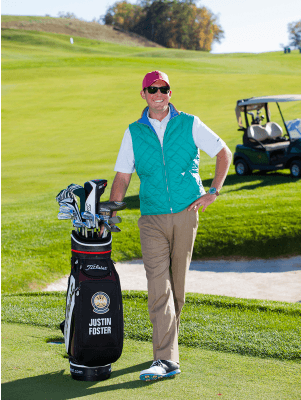 V1 Pro Justin Foster was recently recognized on the Golf Digest 2018-19 'Best Young Teachers in America' list. Read on to learn more about his journey to the top. Past Teaching Experience: Medinah Country Club, Glen View Club, Augusta National Golf Club, Doral Resort and Spa, Bull's Bridge Golf Club, Seminole Golf Club, Old Marsh Golf Club and the TPC at River's Bend. What are your thoughts on being selected as one of America's Best Young Teachers? It goes without saying that it has been a tremendous honor to be recognized by Golf Digest and to be included on a list that is littered with so many dedicated instructors. Receiving the honor was without a doubt one of the neatest experiences of my life. I really enjoy giving chipping and pitching lessons. There are so many adjustments one can make to produce different results with the golf ball, which really keeps it interesting and ever-changing. I feel my approach is a bit unique and the information that they will collect during the lesson typically deviates from their preconceived notions. It is always fun to surprise people with new sensations and results. What is the biggest swing flaw you see in students? To me, it seems the biggest difference between recreational golfers and professionals is the absence or presence of forward shaft lean at impact. This can be attributed to many different things but I think if I could summarize in one sentence, why most golfers aren’t hitting the ball better, it is because their hands aren’t in front of the ball when they strike it. What is your favorite way to use the V1 Instruction Platform? I like to compare a student’s rehearsal swing, practice range swing and playing swing. I find the differences are rather revealing and provide a basis for where the immediate opportunities are.